Just finished my Sunday night television watching, a mix of baseball playoffs and Masterpiece Theater. Sitting in our tv room I was keenly aware of the empty chair next to mine where Carol would sit on these Sunday evenings, and I was struck by the thought that down the road I might well be rattling around this big old farmhouse by myself. For now, she is lying across the room from me on the sofa, talking as she sometimes does, more or less in her sleep, to some voice in her head. I imagine that one could construct a graph where the horizontal axis would represent time, and the vertical would indicate positive or negative states of mind. For non-dementia people a positive jump up might occur at that time when some goal was achieved, such as a promotion or finding a romantic partner while a negative step down would occur when a job was lost or a romance ended. But the ups and downs for Carol on such a graph would not involve any of those kinds of life events. Rather, they would correspond to cognitive, emotional, or physical changes as her disease runs its destructive course. There would be few upticks, and steady incidents of downward motion from which there would be no recovery. Visually, that horizontal line would move along on an even keel for a while, then drop down, and continue on the lower level, until it dropped down again,and so forth, sort of like the elongated image of a staircase. Certain objects in our house could be placed on those steps down. For example, there is the cane in the corner next to the bookcase. It represents the decline in her ability to walk, first noticed at a visit to the lakeside home of our good friends Marcy and Bob, who had invited us out for a boat ride. Walking along the plank path leading to the water, Carol was unsteady. Marcy suggested she might be having a vision issue related to her glasses. I suspect she was half right. Eye to brain, probably, but not the glasses. When the unsteadiness continued after fiddling with the glasses, we got the cane for her without knowing that the dementia had started to work on her. As she began using the cane, other accommodations had also to be made. Her unsteadiness posed a problem in the bathroom where stepping into the tub shower became difficult. I remembered the grab bar at her mother’s house, and installed one on the wall next to the tub, and another, which used powerful suction cups, on the tiled wall in the shower. Even with these aids, she would sometimes grab the towel rack for additional support, as she stepped out of the tub. In the tub itself, we first put a shower stool, and then a shower bench. A walk-in shower would have been easier to deal with, but you deal with what you have. So, she had clearly made an irreversible step down. My mistake then was to imagine that she would remain on that level, that the accommodation would work. Of course, it did. But only for a while. 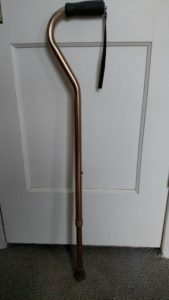 The cane would be discarded in favor of a walker. 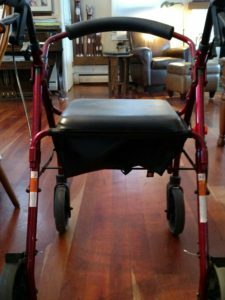 Since Carol was still ambulatory and even thought of taking walks outside along the road, we opted for a four-wheel model, which included a seat, the idea being that during those planned outdoor walks, she could sit down for a rest. In the house, I could sometimes save her the difficulty of walking from point A to B by having her sit on the walker’s seat and pushing her as though she were in a wheelchair. 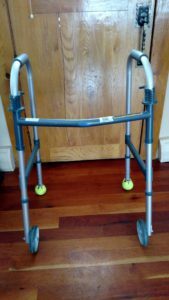 At this stage, when we went grocery shopping, I would leave the walker in the car, get the shopping cart, and she would use that as a kind of walker. That notion of outdoor walks turned out to be unrealistic. I’m not sure, at this point, if we ever succeeded in getting up to the road. My memory tells me that on one or two occasions, we made it up the driveway and onto the grass, which the four wheels of the walker were supposed to handle. But that did not last long. 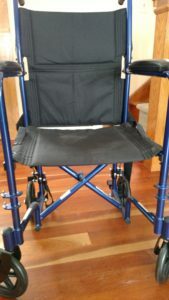 She took a more sudden drop onto the next step, and the wheeled walker had to be abandoned in favor of a four-legged pick up and put down variety such as the one her mother used. I added two wheels to the front legs, and cut off tennis balls for the rear. It didn’t take long for her to get the hang of that set-up. She stayed on that step for a while, but it was significantly further down from the starting point, which I would mark as pre-dementia. I can’t be precise in drawing my imagined graph. It seems to me that for some time, she managed with that walker. But then the stairs started to cause anxiety, and I installed two grab bars on the second floor where she would step onto the stairs. In a similar way, our old farmhouse offered more steps going out of the house and into the garage, and so I attached more grab bars at the two points where doorways opened to a couple of steps. With these accommodations, while she was doing decently well in the house, on the occasions we went somewhere, to a doctor’s appointment, or to the restaurant where we usually ate once a week, the walker was proving to be a bit troublesome getting from the car to the building, through the door, and to somewhere inside. We had already obtained a handicap placard, and now bought a transport chair, which I would load into the trunk of the car, and then use it to access whatever building we were entering. In the restaurant, she would remain seated in the transport chair at the table. At home, we would, for a while, perform the same strategy of going to the dinner table in the transport chair. The transport chair now sits idly at the foot of the stairs because of the next step down. Carol began to have serious problems ascending those steps. I would get behind her and encourage her to go up. For a while that approach was working, but not for very long. After a time, she would panic at some point going up leading to increasingly untenable situations where she would insist on sitting down where there was nothing good to land on. Positioned behind her, I could ease her down into a sitting position and then help her back to her feet. She could then be encouraged to resume the upward direction. Until she wasn’t so to be encouraged, and we gave up on her going upstairs, the state we are now in and have been for some time as I write this. And then some weeks ago, another big downward step as her panicked fear of falling deepened to the point where she no longer can stand up, never mind walk. This inability is not due to muscular weakness. Her legs remain quite strong. But her head convinces her that she is falling. That level has steadied for the while. Throughout this period, I harbored the fond hope that the downward motion could be changed, that she would again climb the steps, and failing that, that she would again stand and use the walker, or failing that, that she would stand long enough to pivot onto the chair. The movement charting her condition is a one-way highway. One with no place for U-turns, or off ramps. I look back over my imagined graph, an object associated with each dip, each object intended to counteract the effects of the inevitable decline. The odd thing is that at each point, these objects were like stations on a railroad track, but not any station, more like a depot or destination. In my mind, I now realize I concentrated on the temporary pause in the movement, thinking of it as a place where this hideous journey would stop. Foolish, of course. In hindsight, blindingly so. But at each station, I imagined we were detraining, picking up our luggage and moving into our new quarters. You see, I can hear myself saying to myself, those new grab bars I so cunningly installed, have now enabled her to deal with the stairs, or navigate her way through those pesky doorways. And each time when this false comfort was dashed, and we were back on that cursed train, we would approach a new station, and I would provide its necessary item, a new walker, or a shower bench, or a transport chair, and repeat the fantasy, we would detrain and stay for at least a while. And each time that hope was dashed much sooner than I expected, and we were back on the track heading to some final destination, where at long last we would be at trip’s end. The question then is whose destination will it be. Steve, I’m sorry for you both. Have you seen the film, The Notebook? It is such an inspiring story for one who is losing a spouse this way. Good post Steve. Thanks for sharing. Watching similar patterns of behavior with my mother. I feel it too. Steve, this is so beautifully expressed that, once again, I felt almost part of the journey. Thank you for opening our perspectives. Keep writing, please. Thank you for such a clear and heartfelt description of your experience. Reading your blog posts shows me the power of your non-fiction, memoir writing. Take care of yourself in every possible way.